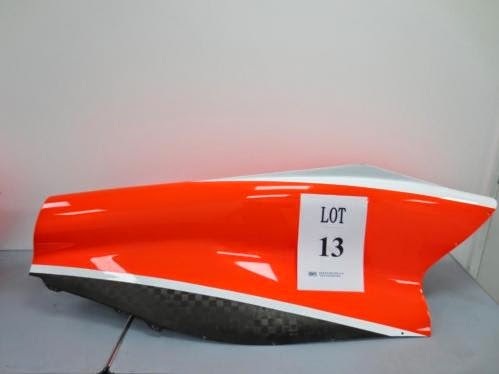 Last month the Marussia Formula 1 team auctioned off a lot of their stuff, with "stuff" being defined as work shop, tools, cars, and just about everything but the Ferrari engines that their cars used last year. Just for the heck of it I registered to bid, thinking maybe the lot of 300 Marussia polo shirts, or 100 baseball hats would be fun to have. Besides, with 400 leftover souvenir trinkets, I wouldn't have to do any birthday or Christmas gift shopping for the nest 50 years! Well, long story short, watching some of the bidding live on the Internet, some of the carbon fibre cars (without drive train remember) were going for pretty large amounts of money, and what did I need 300 polo shirts for anyway? I mean, sure, you could just wear them and only have to do laundry about once a year, but other than it was a bit impractical. Probably lucky for me I didn't win the auction. It might have made a cool conversation piece, mounted on the wall, in the garage, or maybe as a modern art lawn sculpture.